Lemon Drizzle Cake is the classic British lemon loaf cake that will forever be a teatime staple. With no messy frosting, tidy little slices can be easily managed without a fork and go neatly into packed lunches for school or work. The fine-crumbed, velvety texture makes this my favorite lemon drizzle cake. My mother was probably the first home cook in America to get a Cuisinart food processor the minute it came on the market. And she loved making cakes in it, or by hand, not with a mixer. I rarely make cakes in it, but I like to use it for one of her favorites, Lemon Drizzle Cake, as well as our Whole Lemon Cake. Using a food processor, you don't even need to use a fine grater for the lemon zest. Just take off the peel in strips with a vegetable peeler and throw them into the food processor with the sugar and run it for a few seconds before getting on with the recipe. The food processor makes quick work of lemon drizzle cake. The lemon drizzle disappears into the cake, so some people like to also add a visible powdered sugar icing, but I don't bother. If I want to get fancy, I slap a few candied lemon slices on top of the loaf. The leftover syrup from them is a tasty simple syrup for sweetening drinks. Do you prefer making cakes by hand, with a food processor, hand mixer or stand mixer? Just did the math. It takes all of 38 seconds total mixing time in the food processor! 1 In 2-cup glass measure, melt the butter in microwave (if you melt it in a pan on the stovetop, pour it into something with a spout); set aside to cool. In 1-cup glass measure, stir together lemon juice and milk; it will thicken a bit as it stands. 2 Grease and flour, or spray with cooking spray, a 9x4x4-inch loaf pan or 9x5x3-inch loaf pan. I use 1/2 tablespoon of softened butter and 1 tablespoon of flour. Preheat oven to 350F/180C/Gas4. Note: I love the square shape of the 9x4x4-inch loaf pan that I initially got for baking my gluten-free yeast breads but use (without its lid) for nearly everything that calls for a 9x5x3-inch pan. Makes it easy to cut cute little triangles for the tea table. 3 In 2-quart glass measure, whisk together flour, cornstarch, baking powder and salt. Whisking the daylights out of the dry ingredients takes the place of sifting. 4 Cut your strips of lemon zest into 2-inch pieces and put them on top of sugar in food processor; process for about 15 seconds. Add eggs and vanilla extract; process for 3 seconds. 5 Give the melted and cooled butter a stir and, with the food processor running, pour the butter through the feed tube in a slow and steady stream, taking about 15 seconds. 6 Take the lid off the food processor, stir in the milk a bit, and scatter the flour mixture over top of the egg mixture. Put the lid back on and pulse 3 times. Scrape the sides and pulse 2 more times. 7 Pour into prepared loaf pan and bake for 15 minutes. Reduce oven temperature to 325F/165C/Gas3 and continue baking for about 50 minutes. 8 Cool in pan on wire rack for 10 minutes before turning out onto wire rack. 9 In 1-cup glass measure or small bowl, stir together well the sugar and lemon juice (the sugar will not be dissolved). With cake tester, thin skewer or toothpick, poke small holes in top of cake. Using a teaspoon, gradually drizzle tiny amounts of the glaze over the cake, allowing it to soak in before adding the rest. I also use a silicone pastry brush to brush the sides of the cake. Plan on this step taking about 10 minutes. There's no point in just pouring on glaze and having it run all over your countertop! Continue cooling for an hour. Beautiful! I love the tender light crumb..an excellent cake, Jean. Angie, thank you. I do love that fine-crumbed texture. Thanks, Ellen. And I, too, am a sucker for blue and white china, this Blue Danube blue onion being my favorite. There is nothing more in desserts that I love more than a pound cake. Lemon drizzle could quite easily be my favourite cake!! It really is delicious isn't it. Funny though that you said it is quintessentially English because I always think of it as American, but I have no idea why! It doesn't matter where it comes from though, it is still yummy! Thanks, Curtains in My Tree! You should read my September post, Sugar - Toxin or Treat? You'll see how I handle it. And, of course, you can slice it and freeze it, bringing out one serving at a time! Thanks, Sully. Yes, "lemon" is one of the best words in the dictionary, as is "drizzle." The lad has it right with his "He doesn't do anything, he's an author." The words and ideas seem to come so easily to you! I have to give it a try, it's far too tempting to me, I'm a fan of every cake with lemon !!! Let me tell you that your shots are always so stunning, the transferware you use to surround your dishes with are always so superb, thank you for sharing also this Beauty with us ! Dany dear, thank you so much. I wish I had thought to take photos of my mother's food -- she was a master of "presentation" -- but I can picture them in my mind! Looks wonderful. I've always used a mixer without thinking about other options. I'm going to try the processor next time I make a cake. I'd never thought of using my food processor - and Heavens! Don't tell Mr Shoes that's even possible because he might say that my Precious Kitchen Aide mixer that I waited literally YEARS to have wasn't maybe so necessary. If he says that out loud, there will be trouble. I use my Precious (think Golem with the ring here) for all manner of baked goods (I'll definitely be trying this lemon loaf, like tomorrow! Pinned it), & I look forward to some attachments for the Precious too. Visiting from the AIM link party; I hope you'll make time one day to stop by the 4Shoes & let me know you've been. Sugar, it's pretty amazing -- this cake took 38 seconds of mixing time! Vee, thank you. You can make this by mixer as well; just follow the directions in my Perfect Pound Cake, posted a couple weeks ago. I prefer making cakes by hand but I rarely make one !Your cake looks delicious...Thanks for sharing and visiting !Hugs, Maristella. Thank you so much, Maristella! Thank you, Martha Ellen. I hope you'll give it a try in the food processor; quite amazing. Oh how I love a lemon cake such as this one with a cup of tea. Just perfection and delicious too. Thanks for visiting me at Delights of the Heart. Marilyn, thanks. I'm just about to have a slice now with a cup of Assam. Jean, your lemon loaf looks amazing, and so pretty on that blue platter. My mom had those same dishes. They're beautiful! Judy, thank you, but anything looks amazing on that platter! :D How fun to know that your mom had the same dishes! I can almost taste the lemon in it!! I would love to experiment with this recipe and see if I couldn't do a limoncello cake. Lemon has to be my all time favorite flavor that I want to put into everything. Really a keeper of a recipe. I'm pinning! Have a Happy Easter. Straight up YUM, Jean! I took one look and knew this was right up my alley. I love a lemon cake--not too sweet or fussy. I am hand mix all the way. Somehow it always seems so quick to whip things up by hand. As always your photos are so compelling! Thanks, Marisa! And Pins and such are much appreciated! I love a good limoncello, and you would simply replace 1 or 2 tablespoons of lemon juice in the "drizzle" with limoncello. I need to pick up another bottle; I'm completely out. Sue, I agree about hand mixing. I do most everything by hand, except when my shoulder (or some other "part") is acting up; then I'm happy to share the load with my food processor, stand mixer, hand mixer, blender or immersion blender! I hope you'll make it soon and let me know how it turned out for you. I still have some Meyer lemons on my tree and they would be perfect for this cake. I am pinning this and hope to make it soon. Happy Easter! Thank you, Gerlinde. Much appreciated. Perfect for spring, and I wish you a splendid spring! 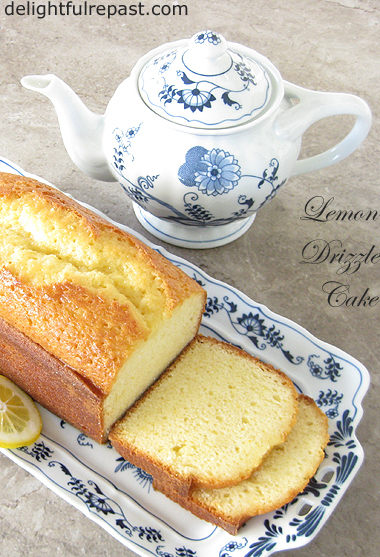 Lemon drizzle is one of my absolute favorite cakes and I agree, no icing is needed. I only own a hand mixer so that's my go-to cake method. Pauline, sometimes it just seems easier to pull out the hand mixer (or a big spoon) than go into overkill with the heavy-duty equipment! oh good grief!!! this is one of my favorites! you have made me hungry! wishing you a very nice evening. I've had lemon pound cake, but not lemon drizzle cake. I always learn interesting desserts on your blog. I hope you find a Filipino restaurant in your area! Thank you, Margie. And I hope you'll try the cake sometime with your tea! This looks so delicious. I do love a lemon loaf with that sweet/tart drizzle topping. Perhaps a project for this weekend! Lorrie, thanks. And that sounds like a good plan. I might make another one then myself! Lemon cake with a cup of tea sounds like heaven, Jean! 38 seconds in the food processor sounds like a winning recipe, too. Thanks for sharing, Jean. Happy baking! Oh, and this cake looks perfect for a spring lunch or Easter dessert! Thanks, Kitty! And happy baking to you, too (and the grands!). Aw, thank you, Melissa! I hope you like it as much as we do. Good to hear from you! Thanks from Grammy Dee, #WednesdayAIMLinkParty, social media shared. Thanks, Karen! I love lemon, too. So much better than chocolate! Grammy Dee, I appreciate that! This cake is so pretty and it positively screams spring to me. It would be lovely for Easter weekend! Thanks, LR101! Yes, it can be dressed up for any spring celebration. Oh boy, now my mouth is watering for this delicious looking cake! I love lemon cake!! Pinning for after my Weight Watchers journey!! This looks ever so wonderful! I would love a piece right now! Thanks for sharing! Debbie, thank you! Wishing you all the best with your Weight Watchers program. I have a friend who is doing very well with it. Bernideen, thank you. I know YOU know a bit of cake that goes well with tea when you see it! ok I have to pin this! I love love love this type of Cake. Thank you for sharing how to do it! Happy to find your blog at the Bloggers Pit Stop! Ooooh yum, this looks and sounds so good!! Your images are so creative, you certainly presented it beautifully!! I think I've probably told you, Jean, that I love everything and anything made with lemon! This will be tried soon - maybe this weekend if I can get lemons at the farmers market. As for what method I'd like to use when making a cake? My answer is – any method that makes for a good cake! I find some do better in the food processor, while some cakes come out better when beaten by hand. Suzie, thank you so much! And for the Pin! Hope you'll try this one soon. Debbie, thank you! I learned to appreciate presentation from my mother, who was really good at it. I try! Thanks, David. I do hope you can get some lemons at the farmers market. I'm with you on the love of all things lemon! Sometimes I combine methods when making a cake; you probably do that, too. I love that tip about using the food processor for lemon zest. And I must make this lemon loaf. Sounds really fabulous Jean. Thank you, Lea Ann. You'll be amazed to see how quickly the food processor makes lemon zest! Tanks so much for taking the time to stop by!! Thanks, Debbie. Hope you're having a great weekend! You must have learned so much from your mother being a great cook. This cake sounds delicious, I would like a slice with a cup of tea. I usually make cakes with a hand beater. I love a good lemon cake. This is beautiful and looks delicious. Pinning! Kathleen, thank you. A hand mixer often seems like the easiest way to go, easy clean-up and all. Yes, my mother was the best teacher; she made everything simply THE best version of whatever it was. Oh I will not forget to pin this yummy cake, my friend. I have that Hutkenreuther platter where you have the cake. Thank you for sharing the recipe too. Thanks for popping in to visit, you made my day! Fabby, thank you! I'm not surprised that you have that platter, too! Hello Jean, the cake looks and sounds delicious and you have convinced me that using a food processor would be very sensible. :) I always use a hand mixer because that's what I have. Oh, I wish I could have a slice of that cake with a cup of tea now! Thank you for sharing. Have a happy Sunday! Thank you, Sara! Would love to have tea with you in your woodland garden! Hi Jean. I love lemon cake, lemon icing, lemon curd and lemon ("marmalade") , you know what I mean, couldn't think what else to call it. Anything with lemon in it in fact.Your lemon drizzle cake sounds great. However, I think you have left me out. "Do you prefer making cakes by hand, with a food processor, hand mixer or stand mixer?" I haven't got a food processor or a stand mixer( I think I know what that is.) As for mixing by hand, I think it would take me forever. I use an electric hand whisk. Its kind of the same as a stand mixer except hand held. Do you have those in the States? Yes, we do, Tony. What you call an electric hand whisk we call an electric hand mixer or, as I put it in the post, a hand mixer. A very handy kitchen tool! And I'm with you on the lemon -- I love lemon everything! You had me at Lemon Drizzle. Once I get through my surgery and can eat something like this again, it will be tops on the list to make! Lemon is my very favorite! There's something about spring that always brings to mind lemon cake. Maybe it's because I used to make one for my sister's April birthday. I usually make a lemon poke cake, but it looks like now I have options ;) Thanks, Jean. Jeanie, thanks! I was just thinking about you yesterday and wondering whether Spring had sprung yet up north. Hope everything goes smoothly with your surgery and recovery. Thanks, Ruth! Yes, no matter how busy you are, with family or book writing, you can whip this up in no time! Congratulations! Your post was my feature pick at #WonderfulWednesday this week. Visit me on Tuesday evening and to see your feature and pick up your badge! All hosts choose their own features so be sure to return to my blog. I invite you to leave more links to be shared and commented upon. Thank you, Marilyn! You are the hostess with the mostess! What a lovely lemon drizzle cake, Jean! I must admit, I use my Kitchen Aid stand mixer most of the time. I have a Kitchen Aid food processor but the poor thing rarely makes it out of the cupboard. I do agree, Lemon Drizzle Cake is the quintessential British Tea Time Cake and yours looks absolutely wonderful. Thank you for sharing with us at Hearth and Soul. Hope you will visit again this week! Thanks, April! Wish I still had a piece left in the freezer, but it's all gone! Will be making it again soon. Dawn, do you have an electric hand whisk? Not as quick as the food processor, but a lot easier on the arm than a wooden spoon! My wife loves lemon cake and I collect recipes to make for her so I'll add this to my collection. Looks like it'll taste great! Richard, thank you. It makes me so happy to think of you making this cake for Marilyn! Thanks, Bridget! I'd make another today, but I'm out of eggs. Wow, this is a popular post. This post made the most-clicked list on the Blogger’s Pit Stop. Congratulations. Be looking for a feature on Friday. Well done. Kathleen, that is amazing! Thank you! Mmmm, lemon. One of my favorite flavors! This is a terrific looking recipe. And I'll bet its flavor is better than its good looks! Thanks so much. John, thank you so much. It's definitely one of my favorites. I love lemon Jean, and this sounds divine! Thanks for sharing with SYC. Thank *you,* Jann. I think everybody loves lemon! Oh. My. Goodness! Your lemon loaf looks amazing, Jean! It looks perfect, in fact. Love me some lemon loaf! Unfortunately I cannot enjoy anything like it right now but I'm hoping, in a couple of months I can indulge in a tasty treat such as this. Thanks for the recipe. Sandi, I hope you'll make it once you're able to eat such things, and do let me know how it turned out for you! This sounds so good right now! Thank you for linking up at #TheBloggingGrandmothersLinkParty. Thanks, Lori! Wish I had a slice of it right now. Martha Ellen, thank you so much for letting me know! I'm delighted that you liked it! If something can take a lot less time and be just as good, well, count me in! Kathryn, thank you! If I don't make it tonight, I'll get there tomorrow for sure! Thanks, Maristella, and hugs to you! 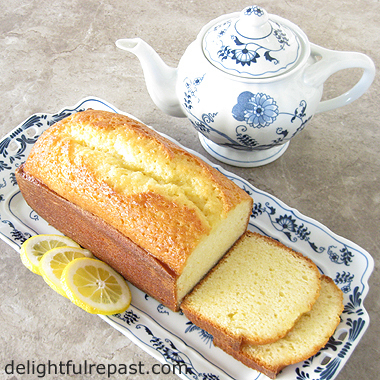 Oh boy - here is another lemon loaf to try. I am on a roll.....I have baked 4 this week so I am up for trying your's soon! Thanks for sharing. Thanks, Bernideen. I hope you'll like it as much as we do. Isn't lemon just the best flavor ever? !